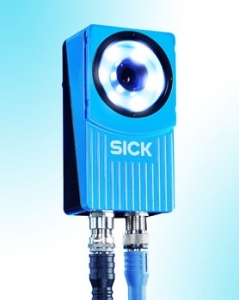 Sick is launching the advanced Inspector I20 2D vision sensor that is said to provide improved user flexibility and quality control performance, as well as offering more detail precision at short/wide or long-distance inspections. The Inspector series is claimed to be as powerful as a camera and as easy-to-use as a standard photoelectric sensor. Complete with a choice of integral lighting, powerful processing, Ethernet communications and rugged industrial IP67-protected metal housing, its competitive price enables engineers to make a decision for quality inspection within existing budgets. David Hannaby, Sick vision systems product manager, comments: "The new Inspector I20 uses the original Inspector I10 model as the basis. The I20 now offers a choice of Inspector models to meet application needs, especially where higher precision over a greater inspection range is required. Precision where glossy or reflective surfaces cause problems is available with the unique dome light. "The Inspector I20 allows the user greater on-site flexibility and precision with new features such as exchangeable lenses to suit different application requirements and add-on I/O functionality to meet control and information requirements from users, facilitating inspection of more and more complex product features. "At the same time, both the I10 and I20 models are rugged, IP67 protected sensors, and are very easy to install and configure – a unique combination of features for a product at this price point." The Inspector I20 Flex can be reconfigured rapidly to suit changing application needs. Users are able to exchange lenses to meet requirements for a wider field of view or for inspecting smaller objects at up to 1000mm, with corresponding variations in field of view between 350mm and 150mm. An excellent resolution is retained at high speed for accuracy and rapid image processing. According to Sick, the Inspector I20 offers users the opportunity to define output logic and extend quality control performance with greater functionality. This ensures that the I20 will deliver inspection results in a format which is immediately usable, with data that can be incorporated directly into a customer's control and reporting requirements. In addition, the Inspector I20 offers extended I/O functionality, enabling selection of up to 16 reference objects for comparison with the object being inspected, and delivering up to 19 inspection results at once. It also facilitates switching between different products and part types. The housing incorporates either a standard ring light, or an innovative diffuse dome light for inspection of glossy, reflective or metallic surfaces.